The 30th November and 1st of December saw a further two days of hearing at the High Court in London. Once again, it was gratifying to see a good turn out from Silchester Residents which will undoubtedly help to demonstrate to the Judge the strength of feeling in the village. This brings the total time spent on this particular application to five days in court and it is still not over yet. The Court proceedings are to hear an application from the Travellers to vary the existing High Court Injunction to allow them to continue living on the site until the planning process has run its course – which would include any appeals to the Planning Inspector – a process which could take years. This is opposed by Basingstoke and Deane Borough Council (BDBC). The Silchester Parish Council and the Calleva Society have been supporting the BDBC Legal, Planning and enforcement teams. On the Thursday (30th), the Travellers’ barrister completed the case for the Travellers. In general, their argument was based upon three basic premises. The first of these being that they claim to have been resident on the site since February 17th. This is despite the fact that they acknowledge that the site has been left empty for much of this time and that they have only begun to populate the site since the beginning of October. During the period that they were travelling over the summer they stated that they thought of Silchester as being their home. As such, they claimed that it would be against their human rights to be evicted from their home. The second basic pillar of their argument was that it is in the best interests of the children to be located on the site in order to receive a settled education and that they had no other alternatives locations. The final piece of the argument was that their planning consultant put forward an argument to the Judge to suggest that they had a strong chance of receiving planning permission in the near future. All three of these lines of argument were set against a background of the travellers claiming that they were not aware that the High Court Injunction applied to them. A series of photographs taken by residents of Silchester showing that the site has been completely empty all summer and occupied only by derelict caravans. Data provided by our Community Speedwatch team showing that the entrance to the site is on a highly dangerous road. This was supported by an objection letter from BDBC Highways department. A strong argument showing that children cannon be safely walked along the Little London road to access the school. Evidence from an independent planning consultant working for BDBC to demonstrate the numerous planning grounds that stand against the site. An objection letter from Hampshire County Council Countryside Planning team showing that the access route to the site is a footpath/bridleway and vehicular access cannot be granted without permission of the landowner. Evidence from Simon Mahaffey showing that the AWE have a licence to emit low level radioactive particles through the sewage works. Of itself this is not a problem but could potentially lead to harm should AWE suffer a radiation leak – something not unheard of in the past. Evidence that the current development breaches the SSSI restrictions and is on a flood plain. Whilst the evidence was fully presented by the end of the two days there was not sufficient time for the barristers to give their summary statements. The Judge directed both barristers to make their final statements to him by 11th December and he committed to making a preliminary judgement before Christmas and then handing down final judgement on January 12th. Last week we heard that the Travellers barrister had asked for more time for their planning consultant to respond to “new” evidence raised in testimonies of Simon Mahaffey and Stephen Jupp (BDBC Planning Consultant). The evidence amongst other areas featured the potential problems with Nuclear scenarios relating to AWE and abuse of the SSSI. The Judge has extended the period for the Barristers submissions for a week. This means we are unlikely to hear any more before January. It is also fairly typical of the delaying tactics employed by the Travellers. 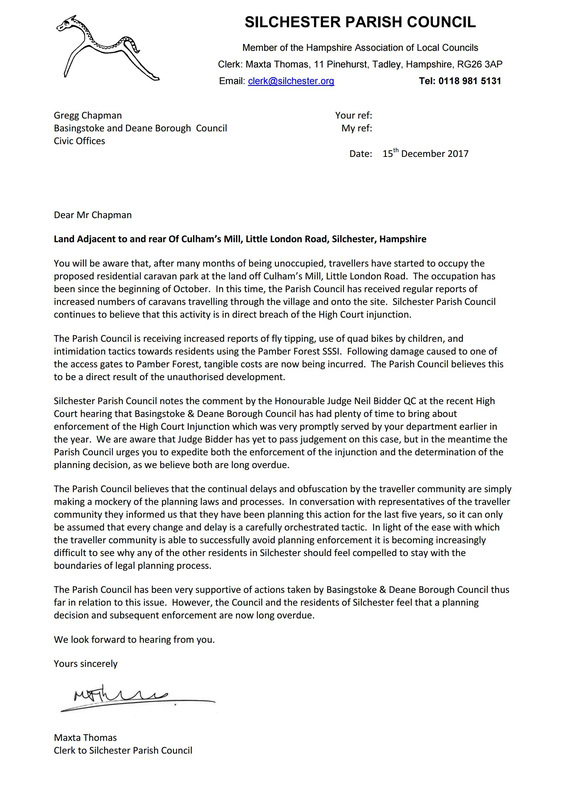 In the meantime, both the Parish Council and the Calleva Society are continuing to press BDBC to make a decision on the Planning application and to take enforcement proceedings for the existing High Court Injunction. See below for a copy of our latest letter to BDBC. Also, thank you for all the reports of movements and goings on at the travellers site. These are all captured and passed on. If you see anything illegal or experience anti-social behaviour please report to the Police at 101. Finally, may we wish you a Happy Christmas and a Healthy New Year.